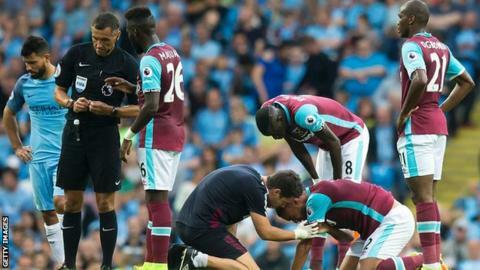 Manchester City striker Sergio Aguero has been given an extra 24 hours to argue his case after being charged with violent conduct by the Football Association for elbowing West Ham's Winston Reid. Aguero has until 18:00 BST on Thursday 1 September to respond to the charge. If found guilty, the Argentina international faces a three-match ban. He would miss Premier League games with Manchester United on 10 September and Bournemouth on 17 September. The 28-year-old would also miss the EFL Cup third-round game against Swansea. Referee Andre Marriner did not see the 76th-minute incident during City's 3-1 win on Sunday and the FA has decided to take retrospective action after reviewing television footage. Aguero is currently out of Argentina's two World Cup 2018 qualifiers next month with a calf injury.